Editor’s note: A review and analysis of Jordan Peele’s “The Twilight Zone” episode three. Spoilers ahead. Jordan Peele’s The Twilight Zone is currently airing weekly on the streaming service CBS All Access. In what is perhaps the best and most powerful story in the series to date, the third episode “Replay,” uses themes in the original Rod Serling’s Twilight Zone episodes “Nick of Time” and “A Kind of Stopwatch” to bring to the screen the real life terror of police brutality in the United States. In using the fantastical plot devices of time travel and being able to tell the possible future, the episode puts on full display an evil that is rooted in our very own reality. 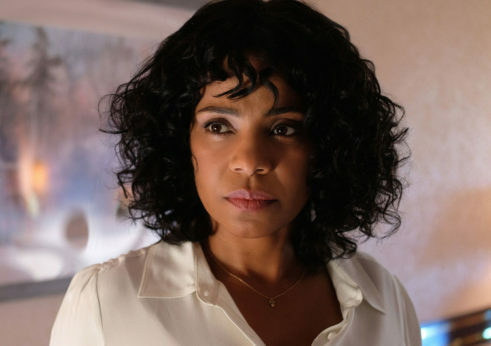 The episode stars Sanaa Lathan (Nappily Ever After; Something New), Damson Idris (Snowfall), Glenn Fleshler (Irreplaceable You), and Steve Harris (Diary of a Mad Black Woman). It is directed by Gerard McMurray (The First Purge) and written by Selwyn Seyfu Hinds. Lathan plays Nina, a single Black mother who is getting ready to take her son to enroll in his first day of college. Wanting to cherish memories of the day, Nina records parts of their trip on the way to the school on an old camcorder. When an encounter with a hostile, and possibly racist, police officer goes terribly wrong, Nina discovers by pressing rewind on the camcorder she is able to go back in time. She is now in a desperate loop to prevent her son from being another statistic in an incident of police brutality, but it seems no matter what she does, the outcome continues to be the same. While the previous episodes, “The Comedian” and “Nightmare at 30,000 Feet,” were entertaining stories, “Replay” surpasses them by far for its strong theme, remixing of the original Twilight Zone tropes, and creating a story that truly stands on its own in the year 2019. The nearly hour-long episode has a steady and enthralling pace, as the viewer is drawn into Nina’s desperate anxiety to save her son and beat the odds of fate and bigotry stacked against her. Lathan’s performance is the episode highlight, as well as her chemistry with her onscreen son Dorian, played by Idris. Nina is a woman who sees herself as someone who escaped her past in order to become the successful lawyer she is today. She grew up in a working poor neighborhood filled with crime and gun violence. She is estranged from her family and feels like she had to survive most of her life on her own without community. She has a hard time asking for help, but as each scenario with the hostile cop Lasky continues to produce deadly outcomes for her son, she knows she has to embrace her past in order to ensure the safety of her son’s future. Lathan conveys the rollercoaster of emotions Nina goes through within the episode with conviction, which results in a performance that is simultaneously inspirational and heartbreaking. In the beginning, Nina tries every way she can to out maneuver Officer Lasky. She attempts to direct her son to be cordial and friendly to the officer but is met with resistance. She makes it so she and Dorian go a different way to school, but still the officer crosses their path as a simple noise complaint results in a deadly fight between Dorian and the cop. Nina in one scenario even tries to befriend the officer before the altercation is set to happen, attempting to humanize herself and her son to the white officer. This seems to make some headway, but in the end even in that scenario, the officer’s bias and determination to exert power over Nina and her son result in Dorian’s death. One could see these various scenarios as symbolizing the variety of ways people of color, particularly Black people, are told to interact with police in order to avoid confrontation and death. The public has heard of many names of fallen Black men and women who have died by the hands of police officers using excessive force. From Stephon Clark to Sandra Bland, many of these scenarios have different beginnings and middles, but somehow end the same—with the death of one more Black person. As reports have repeatedly revealed, police killings affect people of color at an exponentially higher rate than their white counterparts. Black people are more likely to be shot by the police than their white peers. Black men aged 15–34 are between nine and sixteen times more likely to be killed by police than any other group.According to killedbypolice.net, a site that gathers statistics on police killings, unarmed victims of police shootings are more likely to be people of color. It is clear this horror story is not confined to the fantasy realm of The Twilight Zone, but is alive and festering in reality. It is when Nina decides to tell Dorian about the magical camcorder, along with making the decision to get the help of her brother Neil, by visiting her childhood neighborhood, that some form of hope out of the loop can be seen. The family draws on ancestral faith and survival skills to eventually get Dorian to college. In the climactic standoff on the Black college campus between Nina and her rediscovered community and the police officers, Nina decides to no longer press rewind, but to allow the camcorder to record the group of officers. As Nina records, she gives a powerful speech of how Lansky has crossed a line. That they (the officers) have continuously profiled, harassed, abused, targeted, and killed them (Black people), but that this terror ends now. It is a moving moment in the episode, as Nina tells Dorian to walk through the college gates, which could be seen as symbolism of success and true freedom from persecution. It is something of a bittersweet ending, in knowing that although Dorian is able to walk through the “gates,” there are many Black men and women who never made it through, due to having their lives cut short, with no magical camcorder to save them. The episode ends on an even more somber note, as the story flashes forward ten years, with Nina and an older Dorian sitting in the house with Dorian’s young daughter Trinity. Nina continues to use the camcorder for fear of anything happening. Dorian tells his mother that it is ok to finally let go. The camcorder falls and breaks, but Dorian assures his mother that things will be okay. Dorian leaves out to get ice cream, but as he goes, a shadow crosses Nina’s face as we hear police sirens in the background, hinting that no matter what, Dorian was destined to have a confrontation with police. It’s a chilling end that drives home the message that a monster plagues the United States. One that is rooted in the exploitation of Black labor and bodies, with little to no value placed on their lives. Nina, even as a successful lawyer, with a college-bound son, could not escape the institutionalized racism that has made the social media hashtag #BlackLivesMatter a forever necessary rallying cry. “Replay” will most likely go down as one of the best episodes of this season, as it is the most bold in telling a true horror story, and skilled in showing the nuance of hope in the midst of despair and insurmountable odds.